269 Commonwealth is located on the north side of Commonwealth, between Fairfield and Gloucester, with 267 Commonwealth to the east and 273 Commonwealth to the west. 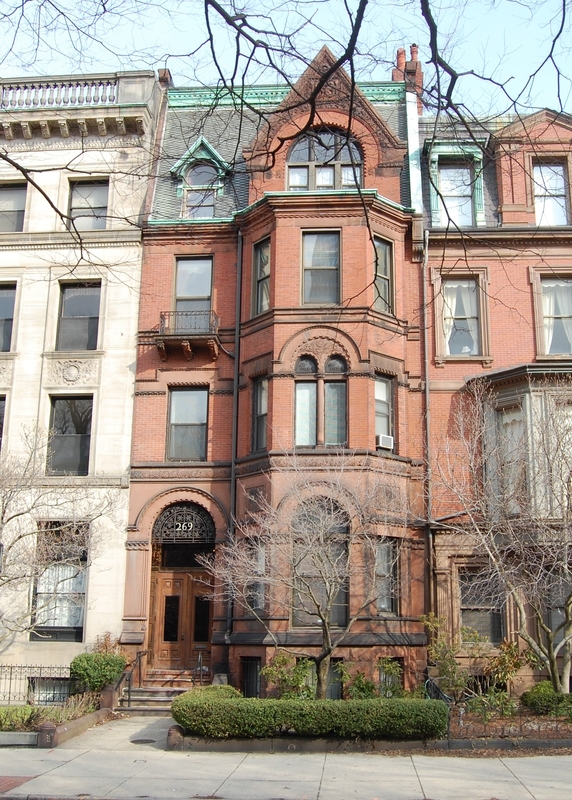 269 Commonwealth was designed by Allen and Kenway, architects, and built in 1881-1882 by Standish & Woodbury and B. D. Whitcomb, builders, for Charles Archbald Kidder. Charles Kidder is shown as the owner of 269 Commonwealth on the original building permit application, dated April 2, 1881. He purchased the land for the house on November 27, 1880, from George Bruce Upton. It was part of a 106 foot wide lot George Upton had purchased on March 22, 1880, from Thomas Jefferson Coolidge, who had acquired it through several purchases. The land originally was part of one of several parcels purchased on January 29, 1866, from the Boston Water Power Company by a real estate investment trust formed by John Templeman Coolidge, Franklin Evans, and Charles Henry Parker. The trust had subsequently subdivided the parcels into lots, which it sold to investors and builders, who then frequently resold the lots to others. Click here for an index to the deeds for 269 Commonwealth. 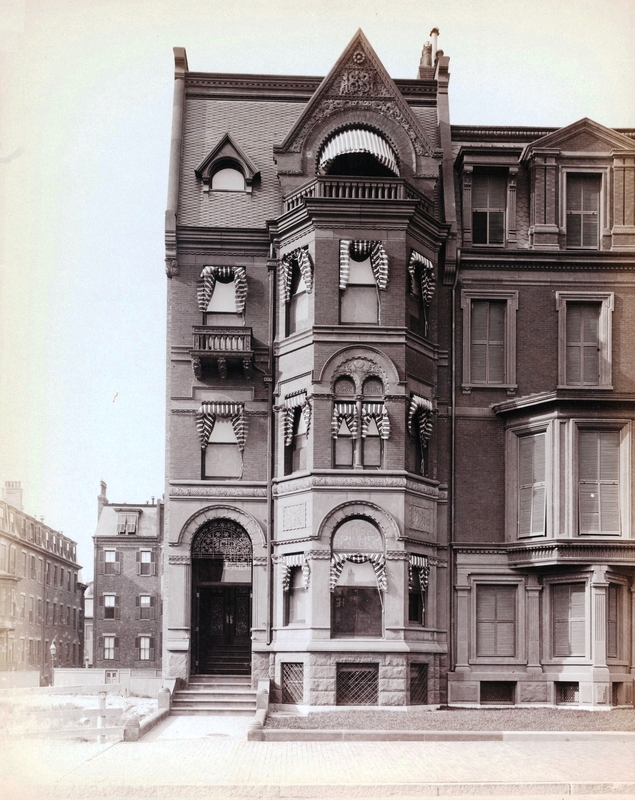 Charles Kidder had graduated from Harvard in 1879 and married in February of 1880 to Harriet Lois Rice, and they probably intended 269 Commonwealth to be their home. During the 1880-1881 winter season, they lived at 22 Marlborough. He was an investment banker in the firm of Kidder, Peabody & Company, co-founded by his father, Henry Purkitt Kidder. Harriet Kidder died in childbirth in July of 1881 in Milton. Charles Kidder (and presumably their infant son, Charles, Jr.) moved to 2 Newbury to live with his recently-widowed father (his mother, Caroline Whitmarsh (Archbald) Kidder, had died in March of 1881 at 2 Newbury). 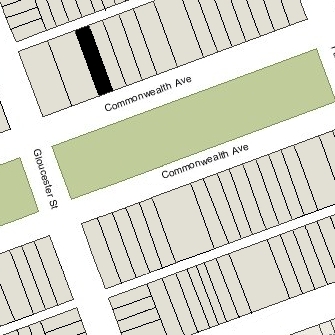 It appears that Charles Kidder never lived at 269 Commonwealth after it was completed. On September 28, 1883, 269 Commonwealth was purchased from Charles Kidder by Eleanor S. (Pearson) Claflin Mack, the wife of wholesale dry goods merchant Thomas Mack. They previously had lived at 13 Arlington. Thomas Mack died in May of 1897. Eleanor Mack continued to live at 269 Commonwealth. Eleanor Mack continued to live with them at 269 Commonwealth until her death in August of 1916. On February 15, 1926, William Claflin transferred the property into his and his wife’s names. Carrie Claflin died in April of 1929. 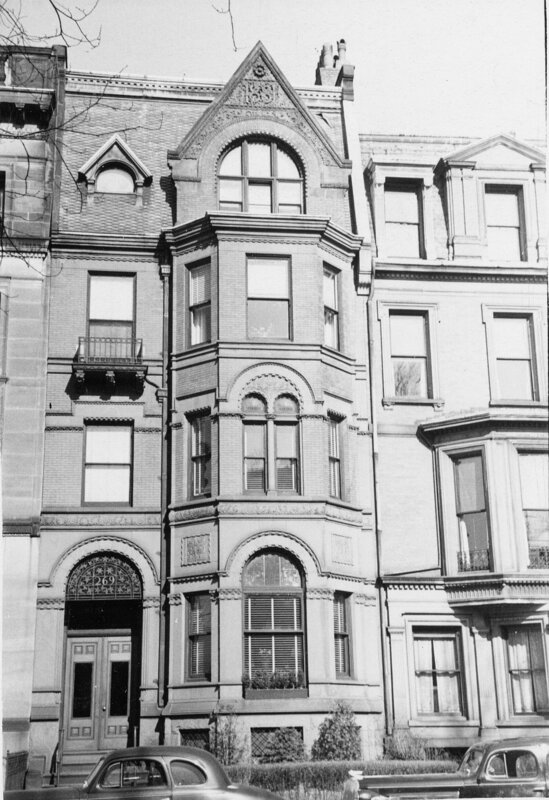 William Claflin continued to live at 269 Commonwealth until his death in February of 1935. On March 30, 1936, 269 Commonwealth was acquired from William Claflin’s estate by Mary F. Donlan. She conveyed the property the next day to real estate dealer H. Leon Sharmat. On September 15, 1936, 269 Commonwealth was acquired from H. Leon Sharmat by real estate and insurance broker Forris Wood Norris. He and his wife, Bessie Everett (Griffin) Norris, lived at the Hotel Somerset. Their son, Jackson Morton Norris, who was associated with his father’s firm, lived with them. In August of 1936, prior to Forris Norris’s taking title to the property, Jackson Norris, applied for (and subsequently received) permission to convert the property from a single-family dwelling into five apartments. On April 27, 1937, Forris Norris transferred the property into his wife’s name. By 1938, Forris and Bessie Norris and Jackson Norris had moved to one of the apartments at 269 Commonwealth. The Norrises separated in the late 1940s and Forris Norris moved to Falmouth. Bessie Norris and Jackson Norris continued to live at 269 Commonwealth until about 1949. On May 31, 1949, 269 Commonwealth was purchased from Bessie Norris by Francis Farrell, and on the same day, he transferred the property to himself and Bryon Randlett Switzer as trustees of the Commonwealth-Newbury Mortgage and Real Estate Trust. On June 27, 1957, they transferred the property from the trust into their own names. On October 20, 1960, 269 Commonwealth was purchased from Francis Farrell and Byron Switzer by real estate dealer Morris Haskell Kalman as trustee of the Adrian Realty Trust. In December of 1961, he applied for (and subsequently received) permission to convert the property from five apartments into six apartments. On August 1, 1962, 269 Commonwealth was purchased from Morris Kalman by brothers, Charles George Alex and Daniel (Demosthenes) G. Alex, and their mother, Helen G. (Kokinakis) Alex, the widow of George Konstantinos Alex (Alexopoulos). In July of 1962 they had purchased 255 Commonwealth and 267 Commonwealth. In December of 1962, they filed for (and subsequently received) permission to convert 269 Commonwealth from six apartments into a lodging house. In June of 1983, Charles Alex sold 267 Commonwealth. He retained 269 Commonwealth and on May 22, 1985, he transferred it to himself as trustee of the C. G. Alex Realty Trust. It remained a lodging house. In June of 1985, Charles Alex and his wife, Helen (Fourtouni) Alex, applied for (and subsequently received) permission to convert 269 Commonwealth from a lodging house into seven apartments. On October 16, 2009, he transferred the property to himself and Helen Alex, as tenants in common. 269 Commonwealth remained an apartment house in 2017.